ARE OUR POLITICAL CLASS BORING US OUT OF BREXIT? BORING US OUT OF BREXIT? Jeremy Corbyn’s letter to the PM on Tuesday proposes that the UK remain in the EU, to all intents and purposes. He went further than he has gone before (see next article). Theresa May’s meetings in Brussels yesterday mean that her non-Brexit Withdrawal Agreement will remain untouched. The best she can hope for will be some changes to the language of the non-binding Political Declaration or a comforting side letter about the Backstop. No changes are proposed whatsoever to all the other unacceptable elements of this ‘deal’. There is now a clean sweep across the House of Commons. None of the above are supporting a clean, true Brexit, and they are not respecting the largest democratic vote in British history. Some readers may point out that certain elements within the above groups are in favour of Brexit. Unfortunately their actions demonstrate that whatever their views, they will capitulate and support a non-Brexit Brexit. In particular we are thinking of the pro-Brexit ERG wing of the Conservative Party and the DUP in this context. The ERG have been negotiating the ‘Malthouse’ solution, which extends the period under which the UK effectively stays in the EU but with no say over laws or anything else - and which extends the period of huge annual payments - until the end of 2021. That’s 5½ years after the UK voted to leave. The DUP will accept anything which keeps Northern Ireland wedded to the UK. The reason for all of the above is that the majority of MPs voted Remain. Some then declared that they “respect the result” but their actions show that they remain Remainers. ERG members tell us that we must accept that “there just isn’t the arithmetic” in the Commons and that they are being politically pragmatic. No, sorry. They failed to address this robustly over the past 2½ years and the result is the majority of MPs thinking they can ride roughshod over a democratic vote. The ERG had their chance and failed. There is not one major news outlet in the UK which backs a clean, true Brexit. Like MPs, they are either for Remain or - in the case of papers like the Sun and the Daily Telegraph - they are for Brexit but will swing in behind a ‘compromise’ deal. This just leaves the people. The people who voted Leave. The electoral majority. After more than 2½ years of incompetence and deliberate anti-Brexit actions by the Government and the Civil Service, most people are fed up to the back teeth with Brexit. They want it done and over with. We suspect that the general populace have been so ground down that they are bored with the majority of announcements coming out each week. They don’t take them seriously because it’s all such a mess. Why concern themselves with an item of Brexit ‘news’ when nothing happens after it? The simple truth is that the only way to influence Brexit now is via massive public pressure on these anti-democratic MPs. We call on every single pro-Brexit organisation in the country to urge people to write to their MP, saying that if they don’t vote for a clean Brexit (and the #GoWTO option is now the only possibility) then they will permanently withdraw their votes, starting at the next General Election. This weekend we will update our #GoWTO campaign with a new letter for people to send to their MP. We will step up our continual efforts to persuade other groups to back this with real, effective promotion. To readers who write to say “what’s the point?” we would simply say that right is right. We were given the biggest Referendum in British history to decide the matter. We decided. Now it must be delivered, come what may. Let's not forget that this campaign has political backing, as well as support from other pro-Brexit organisations. 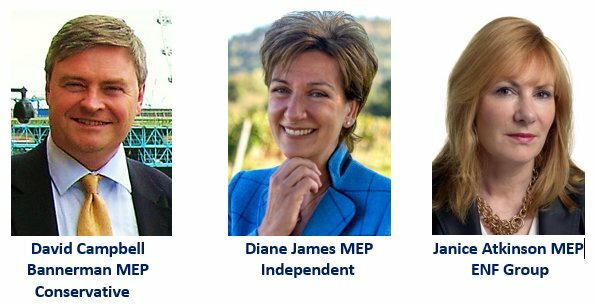 4 headlining MPs, 3 MEPs, and 15 pro-Brexit groups are all for a clean, World Trade Brexit. Here at Brexit Facts4EU.Org we will fight on. We refuse to let the arrogant and anti-democratic political class ignore the people yet again. We must rouse those ordinary people who have almost been bored into submission, and let them see that there is a way to turn the tide. Now is our last chance. Let’s take it. Please support us with a donation today, to enable us to carry on the fight. See below. The 'Go WTO' campaign has the support of MPs, MEPs, and many other Brexit groups, and is really making a difference. It presents a simple, positive, and factual case for a true Brexit on 12 April 2019. Please donate today, so that we can really extend the reach of this campaign for a clean Brexit. The political class is clearly extremely confident that they can do whatever they want, They seem to think that everyday peoples' wishes and intentions from the Referendum don't matter. They can't even be bothered to try to disguise this. The whole argument - both inside and outside the government - about 'if you don't have the power to stop what we decided to do than you should just hush up as we don't care' is fundamentally wrong. Democracy is not about how Parliament can overpower the will of the majority, but about implementing it. We must not give in, that's exactly what they're expecting from us. The 'deal' is no longer the Government's. Parliament have now taken control over Government policy and therefore It is PARLIAMENT's deal (Remain). The PEOPLE, must decide on PARLIAMENT's deal, before these traitors ratify it. The likely deal is no longer Theresa May's ie the backstop. It may also add Jeremy Corbyn's Customs Union v Brexit: out of the EU and all its institutions. In other words, what we voted for. Yes, a second referendum,to try and stop them. This is, once again Remain (Parliament and the 48%) versus Leave the 52%. Parliament need to be challenged and our democracy defended. There will be more delay, and more uncertainty, but anything is better than Parliament agreeing on the May-Corbyn capitulation, with the approval of the EU. On the ballot paper. Do you accept Parliament's deal to Remain in the EU, OR do you want to leave the EU? When Leave win we revert to WTO IMMEDIATELY and then negotiate. Those of us who are members of a political party need to cancel our subscriptions and post a cut up membership card to your MP and ask them to put your vote in the bin, informing them that they will not receive another. Greg Clark, you'll be receiving mine on Monday. Patrick F as the right idea. One thing that directly affects your MP (and local Party Chairman) is the opposition they will face at the next General Election, and that their party will face at the next local elections. When you write to your MP, not only say you will never vote for them again, but that you will only vote for a pro-brexit party, and that you will join that pro-brexit party, help fund them, and actively campaign against the sitting MP. Parties to join are UKIP, The Brexit Party (centre right), and the Social Democratic Party (centre left). And don't just say it, but DO IT also. Too, if you have the time to be a Councillor, you need to put yourself forward NOW. If you want to stand as a party candidate you need to get in touch with that party THIS WEEK. If an Independent, then you have more time. All nominations have to be in by April 3rd. Let your MP know that you will be opposing their party by standing as a pro-Brexit candidate in the Local Elections on May 2nd. Get in touch NOW with your local council on 'How to Become a Councillor'. Too, you could take a stall in your local town High Street to promote a WTO-Brexit, to join up to (or donate to) a pro-Brexit political party - and to shame your anti-democratic MP. Write to your MP to let him know you are doing this so as to demonstrate that you really are going to oppose him. Inform your local newspaper to get publicity. It is also time now for lawful DIRECT ACTION. Use this to embarrass your MP; and for the blame of chaos or disruption to be laid firmly at the door of your sitting MP. Get in touch with your local established pro-Brexit party (most likely UKIP) to help give you the organisation to get your 'Join the Action' message out by leaflet and social media (but make sure the Action and promotion itself is non-political party based, just Pro-Democracy, so all pro-democracy advocates can join in regardless of political party allegiance). a) everyone to take their car out at Monday rush-hour to join the local traffic at the most critical points, and keep doubling-back to those points. b) Weekends, occupy the big local supermarkets, take all the trolleys, take ages dithering what to buy, fill your trolley, then abandon it before the checkout. c) go from garage to garage in the local area, buying just a £1 of petrol each time (and take your time - enjoy the dawdling). Inform the media of the purpose of what you are up to, and inform the emergency services beforehand. Whether you also make a public demonstration at the same time, or do it fairly anonymously, is up to you. You may have difficulty getting a pitch/location (not all businesses/councils will make space available - but you could ask the management of Wetherspoons for pavement/curtilage space, for example). Again, try and make it a pro-Brexit initiative rather than supporting one political party; but you could use the help of an established political party (probably UKIP), and perhaps agree to promote all pro-brexit parties at the same time. It will take some organising, a need to book the pitch ahead, etcetera, so best to prepare now. If there is just one of you, it's perhaps easier to contact a pro-brexit political party for some leaflets (or you can design and print your own if it is just a pro-Brexit / pro-democracy message or information sheet, not aligned to any political party - send a copy to the media and tell them the 'story' of what you are doing and why), then distribute them door-to-door in swing-voter areas, in the MP's own house/road, put up on public noticeboards where allowed, ask sympathetic businesses (pub landlords?) to display material, etcetera. Please note: Your email address is never published. All material © Brexit Facts4EU.Org 2019 except where owned by others. No data about you is stored. The EU requires us to ask you if you accept this.